Hans Schäufelein, Virgil Solis, Wolfgang Stuber. Bol was born in Dordrecht in 1616 and received his initial training as a painter from Jacob Gerristz. Cuyp. Bol seeems to have entered Rembrandt's studio about 1637 to study with Rembrandt not as an apprentice but as an assistant (his earliest signed painting was done about 1635) and established himself as a master around 1642. In his paintings, he imitated Rembrandt's style so closely that some of his works were mistaken for Rembrandt's for centuries afterward. Although his style changed, throughout his career Bol painted many of the same subjects as Rembrandt, especially history paintings and portraits, and was an important painter in his own right after leaving Rembrandt's studio. Roseline Bacou, Curator of Drawings at the Louvre, which possesses a number of his drawings, notes that "During his lifetime, Bol's reputation as a portraitist surpassed Rembrandt's" (Great Drawings of the Louvre Museum: The German, Flemish, and Dutch Drawings, trans. Marguerite Hugo [NY: George Braziller, 1968], n. 92). Bol's etching oeuvre is a small but important part of his work. 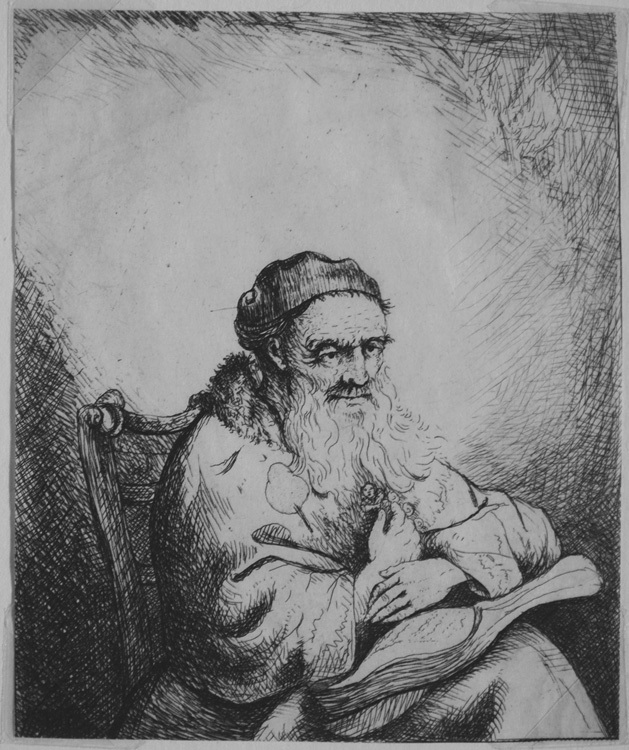 Van Sloten's catalogue raisonné of Bol's prints includes 19 by Bol, 3 she lists as "Ferdinand Bol?," 4 by Rembrandt (for comparison), 1 by Jan Lievens, two 18th-century copies of Bol's etchings, and 1 not by Bol (see Leonore van Sloten, Ferdinand Bol: etsen in eigen huis / etchings at the artist's home [Amsterdam: Museum Van Loon, 2000] for a complete illustrated catalogue of Bol's etchings. 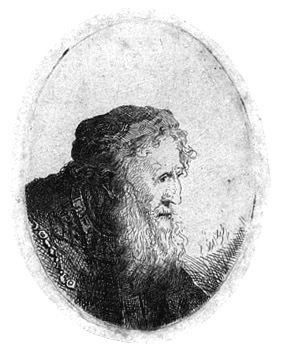 Almost all of Bol's etchings are studies of people and what Bol's etched portraits have in common is that they present powerful depiction of serious men (with the exception of three presenting women), mostly oldersaints or philosopherswho often seem, like Hamlet or Lear, to be pondering the meaning of human existence. For a brief over-view of Bol's career, see the entry in the Grove Dictionary of Art, 4: 249-251, by Marijke van der Meij-Tolsma. Old man with leaf of trefoil on his coat (Hollstein 24, van Slotten 29). Original etching. Van Sloten prints an illustration of this, but has some doubts about it: "Whether this etching is attributable to Bol is unsure: the theme is consistent with Bol's work and the fine lines are characteristic of Bol. Yet the character of the etching is rather messy and, in this regard, is different from other Bol etchings. For instance, the way in which the chair is rendered is quite unlike the other chairs seen on the Seated old man with beret (H. 7) or The Astrologer (H. 8)." One might note in passing that chairs are visible in only 5 of Bol's etchings and that no two of them are the same. The image van Sloten prints differs from ours in two important ways: in ours, the leaf on the sitter's right shoulder is still just an outline, but in the first state as reproduced, it is fully etched in. In addition, there is an undefined spot over the old man's head and shoulder, raising the possibility that ours is a proof of the still unfinished etching. In any case, it is a very beautiful impression combining strength and delicacy that presents the full tonal range from pure white to jet black. Image size: 89x74mm. Price: $3500.